How to transition between the often individualistic world of academic success and the collaborative dynamics of modern industry. This is a guest post by Josh Magsam, PhD. 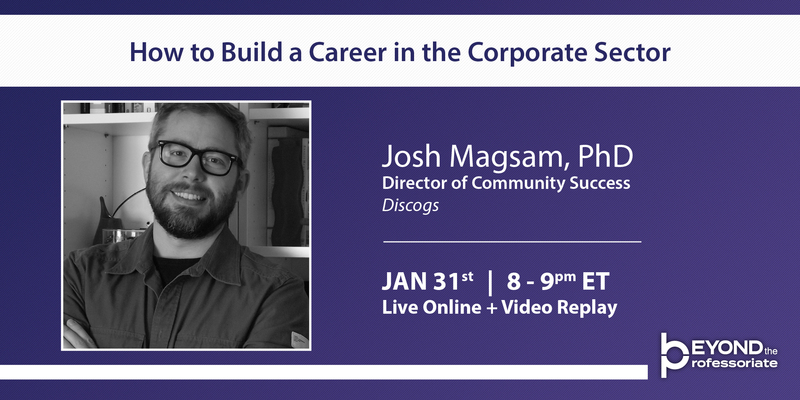 Josh works as director of community success at Discogs.com. He earned his PhD in English from the University of Oregon. So you’ve taken a big step forward and started an entry-level position with a promising company. Now for the next step: learning the ropes, navigating the company culture, and proving you’ve got what it takes to grow within the organization. Many PhDs moving into their first corporate jobs might assume doing that starts with staking your claim, tackling a project that only you can succeed at, demonstrating your unique talents to management in preparation for a niche position, a bigger paycheck, and maybe a more comfy chair. No more small projects, no more routine tasks – it’s all high impact solo work from here on out, right? Progressive corporate culture places a strong emphasis on teamwork, collaboration, and task relevant maturity. In other words, showing that you care about both the success of your teammates as well as as your own, collaborating with them to move the entire team forward on projects, and taking the necessary time to fully mature within your workflow before moving ahead – and even then, likely still within a team context. Well, here’s the best part. You don’t have to! This is a common mistake made by many people starting entry-level positions as a result of a career change. It’s not just academics who make the assumption that focusing their energies on a team dynamic instead of a “lone genius” model is going to leave them in the dust. Multiple generations of workers, across academia, industry, nonprofits, and government sectors, have been trained that personal achievement often comes at the expense of others, and that’s just the way it is. Don’t worry: if this sounds contrary to your training as an academic, you’re not alone. There are strategies you can use to navigate the complexities of a transition between the often individualistic world of academic success and the collaborative dynamics of modern industry. (I’ll share them during my upcoming webinar; details below.) And if you’re already preparing a transition – or are mid-transition – here’s a little background and a few tips to get you started. Ask about teamwork and collaboration during the interview process. How are teams organized? What is the feedback structure like? Is it an open, 360-style system? A one-on-one meeting with peers and/or a direct supervisor? How large is the team, and are there guilds, squads, or other smaller units within the larger team? This information can help you gain a valuable sense of how the team functions day to day, as well as what growth looks like within the team. Talk to your new teammates. Chances are, many of your colleagues had to make a similar adjustment, and if so, they are likely eager to share tips on their own journey, as well as the unique intricacies of what makes your new team function so well. Everyone has pros and cons – ask what works for them, and what they would like to see improved – and above all, ask what the team needs from you! Do what you do best: research! There is an entire library available, much of it researched, written, conferenced, revised, and published again within the last decade, on collaborative environments and structures for successful team dynamics. And that’s before you get to the wealth of blog posts, conference videos, and other scattered resources, many of them incredibly insightful and informative. When I’m asked by anyone to recommend one source to start with, I always point to Tribal Leadership: Leveraging Natural Groups to Build a Thriving Organization , by Dave Logan, John King, and Halee Fischer-Wright. It’s well-written, well-researched, and organized in segments that makes it easy to jump in and absorb concepts in short bursts before doubling back for a deeper read, and serves as a great jumping off point for discussing team dynamics with others. These are just a few points to get you started. Be sure to check out the upcoming Beyond the Professoriate webinar for more tips and strategies for personal and professional success in progressive corporate culture! Josh Magsam, PhD, will present “How to Build a Career in the Corporate Sector” on January 31, 2018, as part of Beyond the Professoriate’s PhD Career Workshop series. Click here for more information and to purchase a ticket to attend live or watch the recording.